When we’re young, we have the freedom to eat as we please. Most people can enjoy a wide variety of foods without any long-term consequences. But as we age, our bodies change and our nutritional needs and tastes change along with them. 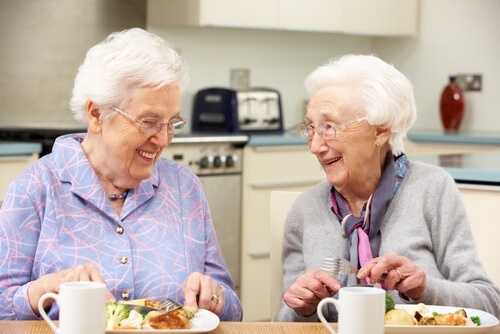 Many factors can affect the dietary needs and preferences of your senior loved one: changes in taste, digestive issues, ability to chew certain foods, mouth sores, and loss of smell may cause your family member to avoid foods he or she once enjoyed. Medical complications related to medications or disabilities may cause additional changes or restrictions in senior eating habits. As your loved one’s needs change, in-home care can ensure that they get the nutritious meals they need to stay healthy. Here are ten ways a caregiver can provide dietary support. Caregivers can accompany your family member to the grocery store and help them choose a variety of healthy foods that meet their dietary preferences and needs. If your loved one is unable to shop, the caregiver can step in and make the trip for him or her. The caregiver will take your family member’s tastes and preferences into consideration while also making sure he or she receives adequate nutrition. Seniors often have trouble adhering to restrictive diets, especially if it requires learning new cooking skills or eating different foods than they prefer. If you loved one’s health requires a special diet, an in-home caregiver can prepare nutritious, enjoyable meals that meet those guidelines. Cooking requires not only the energy to stand and prepare food, but also the mobility to move around the kitchen, reach into cabinets, and prepare dishes. Caregivers will provide as much help as needed to ensure safety in the kitchen as well as a delicious prepared meal. Seniors may lack either the motor skills to feed themselves or they desire to eat when they need to. They may suffer from loneliness that results in lack of interest in eating, or they may have health needs that make eating difficult. 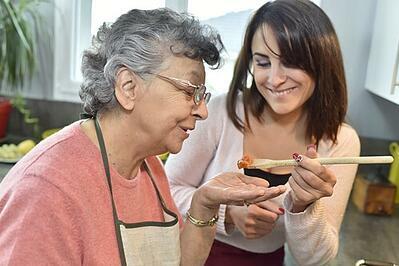 Having an in-home caregiver to assist with feeding can help prevent hunger or malnutrition. Your loved one’s caregiver can also assist with cleaning up after meals, including putting away food to prevent spoiling and making sure dishes have been washed. As seniors age, many struggle with memory loss. They may forget when they last purchased food items and whether perishable items need to be replaced. 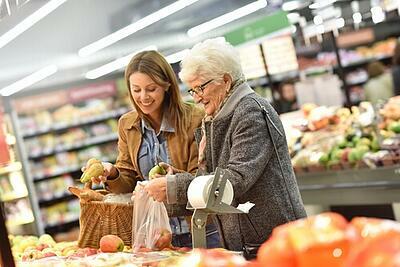 A caregiver can help by checking expiration dates on food and cleaning out the fridge as necessary. Your family member’s caregiver will also make the effort to learn food preferences and help provide meal choices that your loved one will enjoy. Sometimes, your senior family member may forget when he or she last ate, or may not want to eat certain meals. A caregiver can monitor food intake from meal to meal, making sure your loved one eats enough over the course of the day to remain healthy. Similarly, fluid intake can be monitored to make sure a loved ones doesn’t get dehydrated. If you provide the primary care for your Mom or Dad, you know that it can be a time-consuming and difficult responsibility. In-home caregivers can step in to provide respite care, performing all the basic nutrition tasks that you would normally do so that you can step away and rest for a while. It’s not always easy to know when your senior loved one needs additional help at home. But there are several signs you can watch for that indicate loss of memory, mobility, or functioning. When you notice changes in eating habits, behavior, or living circumstances, an in-home caregiver can give you the services and support you need for peace of mind.